Heating degree days (HDDs) are supposed to serve as an indicator for heating demand. At first glance, everything seems obvious. HDDs are a smart combination of the temperature difference between the interior of a dwelling and the outside temperature and the number of days where the difference is valid. (See one of our previous articles for technical details). In an earlier posting we investigated the link between HDD and gross energy consumption. Then the findings were not as convincing as one might expect. An increase in HDD does not necessarily mean that consumption is rising in the same way. On the contrary, in some cases the two parameters might even go in opposite directions. Surely, primary energy demand is certainly too crude a measure to be strongly correlated to simple variations in temperature. Too many other factors like energy demand for transport purposes and manufacturing come into play. At the end of the day, domestic needs and especially heating constitute just a fraction of the total energy cocktail. Thus it is tempting to go one step further and look into a potential, and hopefully more clearcut relationship between HDD on the one hand and consumption figures for heating purposes on the other. We performed such an analysis for the case of Austria, covering the years from 2003 till 2010. The source data have been taken from Eurostat and Statistik Austria. The consumption figures refer to three different sources, namely heating, warm water and cooling. Fig. 1 HDD and energy consumption for heating purposes in Austria, HDD* = HDD/30. The correlation between the two sets of data is obviously better than in our earlier analysis which was based on gross consumption figures. Nevertheless, there are notable deviations from an ideal scenario which require some interpretation. 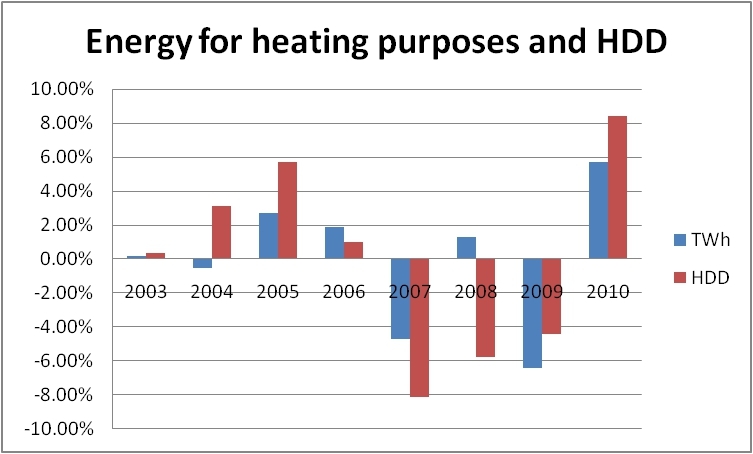 Before the economic crisis of 2008 the amount of TWh that went into heating was fairly stable. Up to 2008 and again in 2010 HDDs show much larger deviations from the mean value than the consumption figures. In some years, 2004 and 2008 to be precise, the deviations have a different sign, thus going in opposite directions as can be seen in Fig. 2. 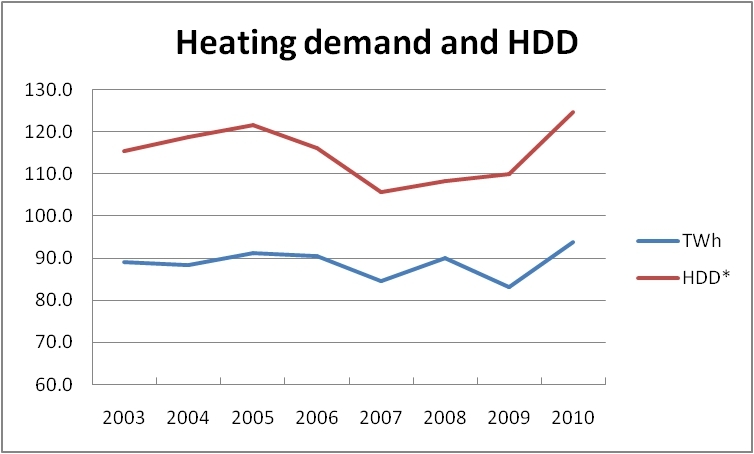 Fig.2 Energy demand for heating and HDD, deviation from mean value. Both, in 2006 and 2009, consumption figures differ more significantly from their mean value than their respective counterparts in HDD. However, we may consider this as an exception. In general, energy consumption for heating, cooling and warm water seems to be more inert than the fluctuations caused by weather conditions. This is good news because it shows that our heating systems are much less sensitive to outside conditions than what we might expect in the first place. On the other hand, it may also indicate that dwellings having a high degree of thermal insulation of which there are many in Austria are less exposed to temperature fluctuations. In some European countries wind power is contributing significantly to the energy mix. At EU level, wind is the second largest source of renewable energy after hydro. Since its early stages in the 1990s the development of wind-generated electricity can only be described as breathtaking. In 2010 the biggest producers were Spain (44,165 GWh) and Germany (37,793 GWh), followed by UK (10,183 GWh) and France (9,969 GWh). All data for this brief analysis covering the period from 1990 to 2010 have been taken from Eurostat. To get a feeling for the tremendous growth of the sector we may note that at EU level wind power has soared by a whopping 537,000 % during the past two decades, delivering some 149,000 GWh in 2010. The result of this incredible surge is that in some countries like Germany, Spain, and Denmark wind can no longer be considered a negligible contributor to the energy grid. Fig. 1 gives an overview of the annual changes of power produced from windmills during the period in question. One stiking feature of this graphic is that the changes may also be negative, indicating that in the year n less energy has been produced than in n-1. This may happen as the amount of wind is fluctuating over the years. However, the negative growth rates are generally quite small, because new capacities are added every year. Moreover, with growing capacities in various areas the influence of prevailing calm tends to get weaker. The other noteworthy issue is that the growths rates are slowly getting smaller. This is not surprising as the countries in our selection have already sizeable quantities of wind mills operating and the extra capacities added are small compared to the existing ones. Fig. 2 gives an overview over the indexed production of wind-generated electricity with 1990 = 100. Fig. 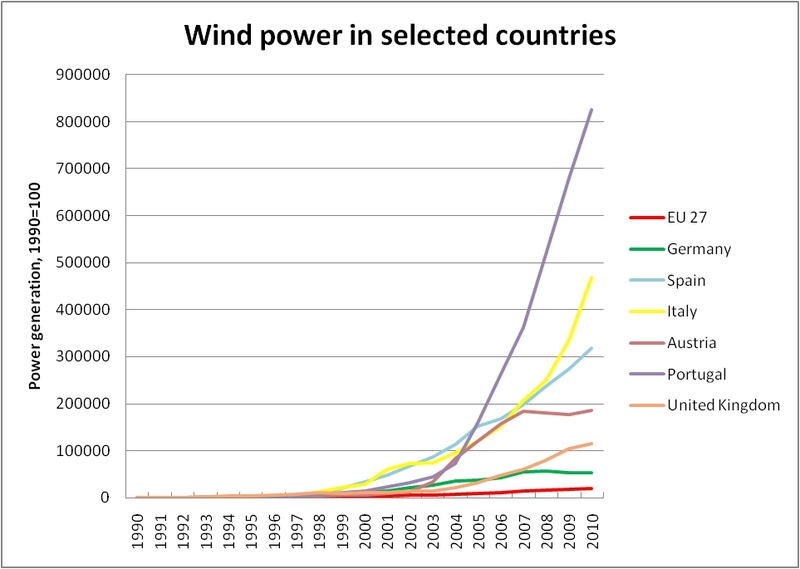 2 Wind power generation in some EU countries, 1990=100. The picture gives a vivid impression of the potential of this source of renewable energy. Although Spain and Germany are the top producers of wind energy, the top performers are Portugal and Italy. It may be noted that the countries selected are significantly outperforming the EU average. The reason is that in some Member States like Poland (1700 GWh), Bulgaria (680 GWh), Romania (310 GWh), and the Baltic states (550 GWh in total) wind power is still in its infancy stage, contributing very little, both in absolute and relative terms, to primary energy production. That may, however, be expected to change in the future. In Malta and Slovenia wind-generated electricity is virtually non-existing. In spite of being an ever growing contributor to the energy grid wind power faces some intrinsic weaknesses which, paradoxically, tend to become more serious the bigger its contribution becomes. The main source of concern is the fluctuating availability of wind in the atmosphere. This, in turn, leads to fluctuations in the energy supply which put additional strain on the entire grid. Conventional power plants have to be kept in reserve in order to counterbalance the variable inflow from wind energy. This is one of the most pressing challenges to be tackled in the near future, if wind power is to be not only a significant but also a stable and reliable player in the whole energy mix. Electric Vehicles – A Dream Turning Real? Electric vehicles are stimulating our fantasy. Are they the magic solution helping us reducing our dependency from oil and paving the way for a greener mobility? Or is it just wishful thinking making us believe that all road transport one day may be switched to electricity whereas, in fact, we do not even have sufficient production capacities to power an entire fleet of electric vehicles? Phillip Muller has performed some interesting research on that issue. Have a look at his arguments here.